Hello, May. This month, we’re covering work-day fashions for spring. Some of the looks are more traditional work-wear, others are more individualistic. Our first look in the new series is menswear inspired. 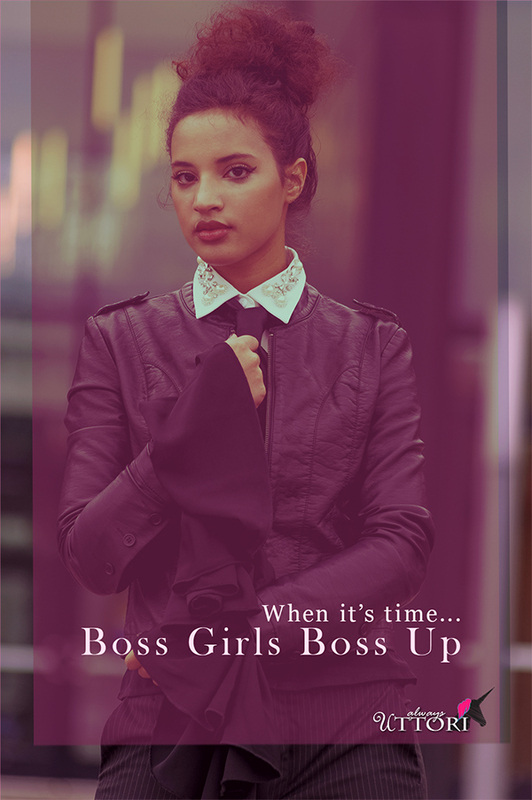 This Spring Fashion 2017, Girl Boss Fierce look takes on male executive styling and adds a few key She’s-in-Charge details. Do you have to be a girl boss to love menswear inspired styles? No, but in my opinion, the menswear touches pull all the elements together for a polished boss look. And, let’s be crystal-embellished-collar clear, the styling may be menswear inspired, but the many feminine touches are a reminder to the boys’ club that there’s room at the top for the girls. So, this girl boss look is not about being one of the boys, it’s about appreciating power dressing as reflected in well-done menswear styling (though it may be the result of cultural dogma that a tie equals power). Menswear has many styling conventions not necessarily found in women’s suiting. The fun thing about a menswear inspired look is the opportunity to add the touches that menswear lacks. In this look, we’ve paired pinstripe, asymmetrical hem pants with what is known as a dickey ( bib collar). Invented in the 19th Century, dickeys were originally created to be worn with men’s tuxedos. They returned to popularity in the 70’s, and now the dickey is, once again, making a comeback. Unlike previous incarnations, the modern-day styles have added more decorative embellishments, like the crystals featured in this look. In the North, spring is still hit or miss in terms of warm temperatures, so this look is layered (which makes it a great fall style as well). 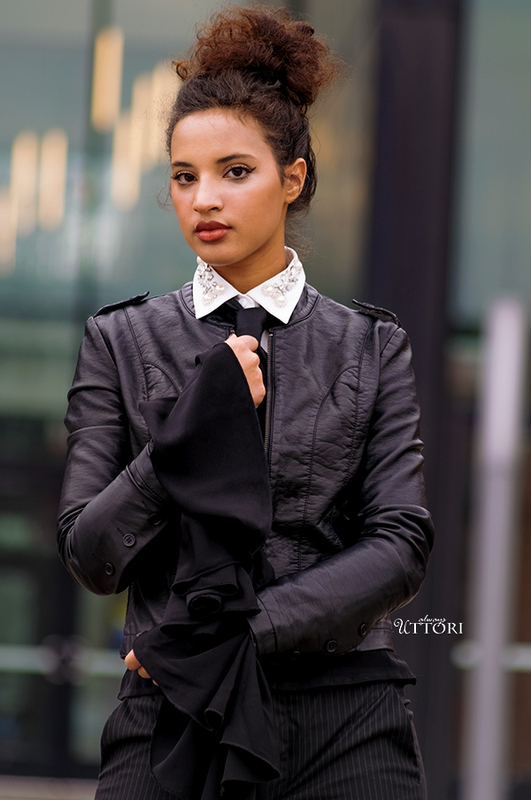 The dickey is paired under a V-neck bell-sleeve blouse, which not only adds boss drama, but a large dose of feminine appeal. For a further nod to menswear, we’ve added a bit of polish with a tie and then contradicted the move by topping off the look with a tough-as-nails leather jacket, instead of a suit jacket. It’s one of the things to love about being all paradoxical. Besides, as the boss, you can wear what you want.